Can't we have it all? A cool city, vibrant economy and affordable housing? Evidence from 100 metros says it's tough. Sometimes I hear people fed up with Seattle’s housing prices wondering where they could move. There’s always someplace such as Youngstown, Ohio. Housing is cheap but say goodbye to a vibrant economy, especially in tech, one of the few sectors to see real growth in this recovery. You get what you pay for. But consider Oklahoma City, Omaha, Neb., and Des Moines, Iowa. The three metros offer affordability, economic strength and quality of life. 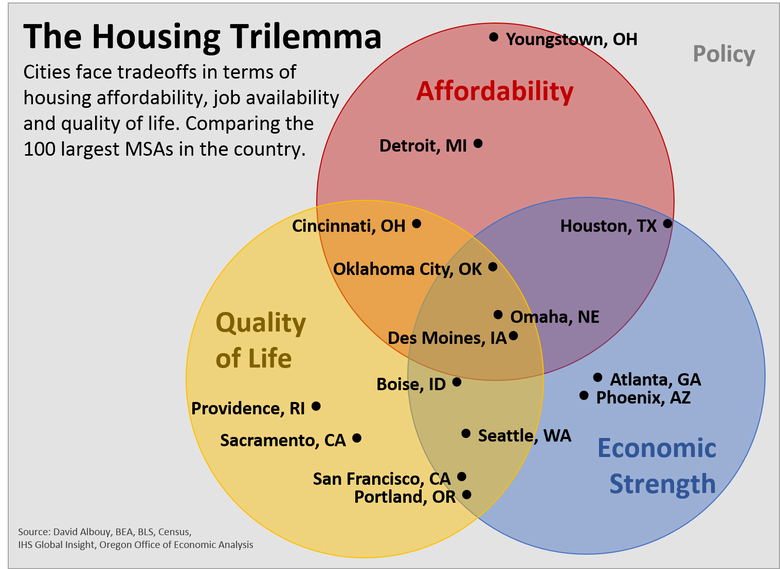 Joshua Lehner, an economist in the Oregon Office of Economic Analysis, lays out the challenge in his ingenious Venn diagram above on the “housing trilemma.” The bottom line is that unless you want to live in these cities of the plains, it’s difficult to have these three qualities intersect in a metro today. Seattle performs well in two of the three (you know where we fall short). Interestingly, Portland falls even further out of the affordability circle, below even San Francisco. All in the “cool city” profile. Of course policy, such as a resistance to building and density, plays a role, too. You can read Lehner’s entire post and download the Excel data for individual metros here.